This kit includes a 32 oz. 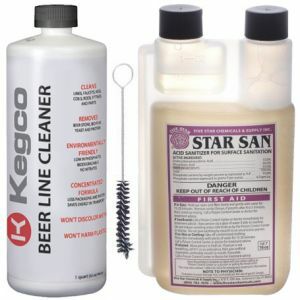 bottle of beer line cleaner, a 16 oz. bottle of Star San sanitizer, and a faucet brush to keep your system squeaky clean. Simply mix some of the beer line cleaner and water in your keg and run it through your lines like you're pouring a beer to remove protein and mineral deposits from the tubing. Sanitize your kegs with Star San, the most popular keg sanitizer on the market. It is non-toxic, odorless, and requires no rinsing when used under 300 ppm.